Pergolas are a stand-alone feature in your outdoor living space. Much like a patio cover or gazebo, they offer some protection from the elements. But there are a few things that make pergolas unique and why they could be the right choice for you. The main difference between a patio cover and a pergola is that the patio cover is attached to the home, while a pergola is free-standing. Most patio covers are entirely covered to offer complete protection from the elements. Some pergolas may be covered, but many are left open. The lattice-like top is perfect for weaving vines and allowing them to grow as a natural pergola canopy. A gazebo is also free-standing, but it is completely covered on top and typically has some kind of enclosure on the sides like half walls or railings. A gazebo is almost like a complete building structure because it also has a floor. 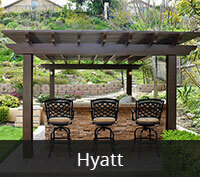 Most pergolas are built on an area that has been paved or laid with pavers or other landscaping material. Living in the San Diego area, shelter from rain is less of concern than other environments. If your main goal is a structure that can provide shade and beauty, a pergola is the right choice for you. Generally, pergolas are the most affordable of the three choices because they require fewer materials and are less complex to build. They also offer an amazing opportunity to combine a man-made structure with the natural beauty of your landscaping by incorporating climbing plants onto them. Building a pergola begins with the design plans. While some people want something very straightforward, others prefer something more ornate. We will discuss what you’d like to see and even look through pictures of different aspects like the pergola canopy and support. We can use different types of wood, but the most popular choice is cedar. They can be stained to match the desired color and blend well with your outdoor living space. Our carpenters have over 16 years of experience designing and building these structures. Homeowners often thinking building a pergola is an easy DIY project. While it less difficult than building a gazebo or patio cover, it still requires a great deal of skill. Doing it on your own can also end up costing you more than it would to hire professionals because you most likely don’t have all the tools required on hand. When it comes to something that will be hovering over your family, you want to ensure it is safe and stable. Don’t take a risk or waste your money. Call us for a free estimate on pergolas in San Diego, Carlsbad, Encinitas, Chula Vista, La Jolla, Coronado and all nearby cities in San Diego County. We are A+ rate by the BBB, licensed, insured and experienced. We can guarantee the safety and satisfaction of your family.